TheSocialGolfer.com (TSG), the online social networking community for golfers celebrated its 4th annual TSG Masters 2017 Championship at Warley Park Golf Club on 22nd April. Golfers from all over the South East of England gathered at the Essex-based club, all hoping to be this year’s TSG Masters 2017 Champion golfer. Thirty-two members of the Online Golf Club had all qualified via a number of different means; some via the website’s monthly leaderboard, some via other TSG Major events with the remaining spaces snapped up via the ballot or by special invitation with no one wishing to miss out on the first TSG ‘Major’ of the year. This made for an exciting competition and while some TSGers were familiar with the new course layout, most were totally alien to it. 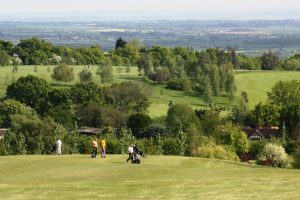 The field ranging from 11 handicappers to 26, played the Childerditch and the Warley ’1 to 9′ loop, two very different layouts offering their own challenges, the latter including some superb water features. As always, it was the greens at Warley that proved the real test, with only seven players reaching 30 pts but after 18 holes, it was Ruth Brand (Sussex) who scored 32 pts and became the first outright female winner of a TSG Major! 2nd was John Barber (Hertfordshire) on count-back with a close 31 Pts, with Dave Allchorne 3rd (Hertfordshire) just missing by a point too. 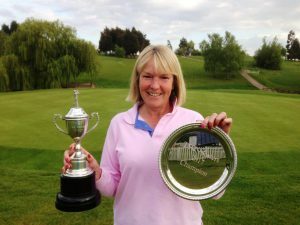 She went on to say...”I must thank TSG for making it one of the golfing days of my life and I can’t wait to see everyone again for the TSG OPEN Championship event at Farleigh GC in July!“. Share the post "Brand lifts TSG Masters 2017 title at Warley Park…"